Getting the Minitaur to perform properly with Ableton wasn’t as self-explanatory as I would have hoped. For days I was convinced the Moog was actually broken on arrival. After exhaustive Google searches, I contacted my Amazon seller and Moog Support to inform them of my issues: hardware glitches, Ableton’s external instrument failing, the whole project crashing sometimes, lack of MIDI automation, just about anything and everything. My audio interface was crashing, my USB ports were freaking out, the Minitaur would disconnect or drop from Ableton’s list of devices – my absolute nightmare. Now, it’s important to note I really wanted to be able to record MIDI automation using the Minitaur Editor, which is a VST that becomes available after you register the device. I knew it offered this functionality, and at this point, the best I could do was run the Moog as an external instrument. When it was NOT connected via USB, it was completely stable. So let me stop here for a moment. This is how analog gear was originally made: as an instrument intended to be played, and captured as a live audio performance. And here I was, trying to get this thing to function like a VST. I wanted to run it as a hardware interface to Ableton, whilst generating amazing deep bass. I wanted to capture that automation, with the ability to go back and modify those envelopes. And I thought it could, even Moog has three videos showing it in action. In the Ableton Preferences, MIDI tab, be sure that IF the Minitaur is featured in the topmost list of connected devices, you remove it. Switch the Control Surface, Input and Output drop-downs to None. Yes, remove it. Down below, under MIDI ports, enable Track “On” for Input: Moog Minitaur and Output: Moog Minitaur, as well. Create a new MIDI track, add an External Instrument. For MIDI To, choose Moog Minitaur. For Audio From, choose whatever audio channel you are receiving via your audio interface – eg., Ch 1. 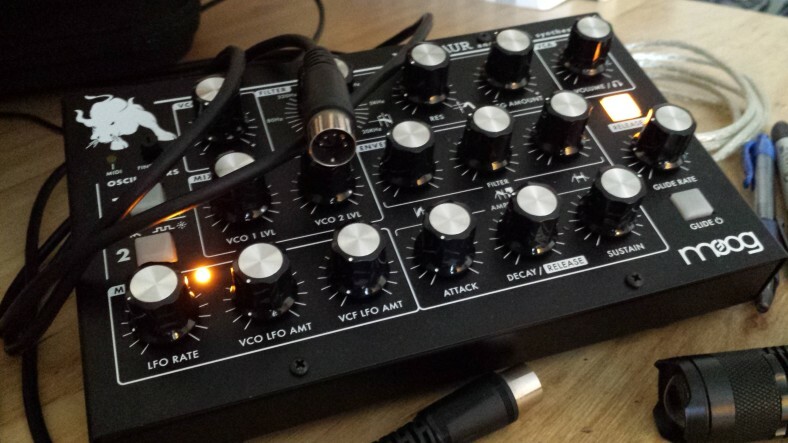 At this point, your Minitaur should be connected via AC power, USB, and have a mono 1/4″ audio cable running from the Moog output to your audio interface’s direct input. You should also have a MIDI controller connected (keys / pads) ready to trigger sound. After a number of different setups, I found the Minitaur was most stable when it had its own dedicated USB port – you may need to secure a powered USB hub for your other devices. If you registered your Minitaur thru Moog, they should have sent an email with a link to download the Minitaur Editor (which is pretty sick, btw). Drag an instance from your plugins directory onto this same MIDI track. 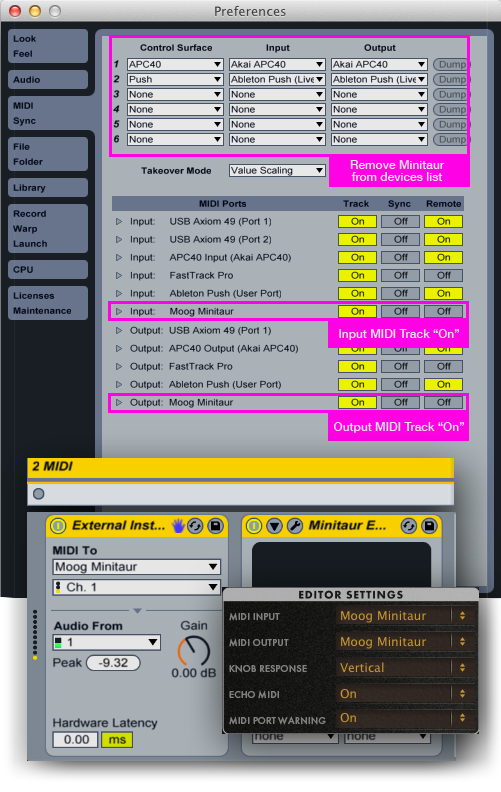 Click the wrench icon from the plugin device to open the Editor – and before you get too carried away flipping thru presets, make sure in the Editor Settings you have the MIDI Input and Output set to Moog Minitaur. I also have Echo MIDI enabled, which updates your physical knob tweaks to match the on-screen Editor. After making this one change (step #1, above), all my problems were solved. It seems that, for some reason, if the Minitaur is listed in the top list of USB connected devices, AND the I/O MIDI ports are enabled down below, some sort of MIDI conflict occurs. It ultimately confuses the gear, the data, and the software. By simply disabling it from the device list, you’re golden. Kinda wish I would’ve known this from the get-go. 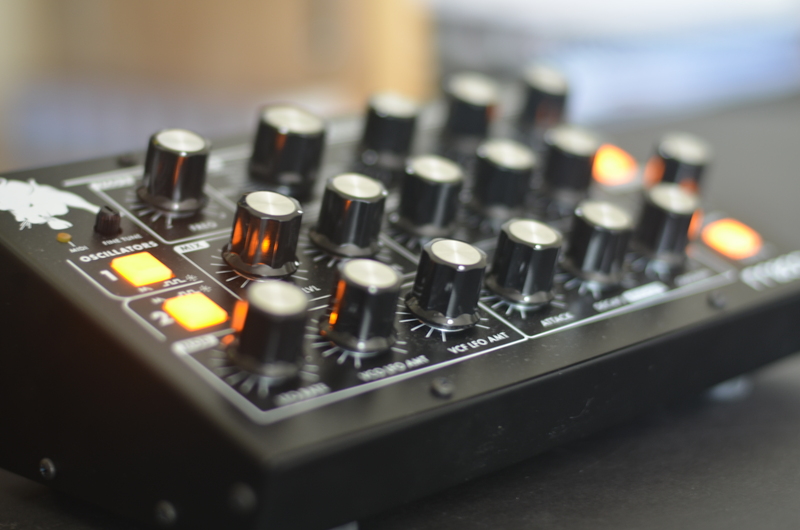 To learn more about the Moog Minitaur with Ableton, see my other post here. I seem to be having some similar problems, but mostly solved them thanks to your post. However, I can’t seem to record the automation – only midi note data and audio out. I tried setting up a separate Midi track with Minitaur Out as the MIDI-in, but that didn’t work. If I am recording the automation somehow, I don’t know how to access it. I have the same Issue and still didn’t find a solution. I’ve updated the firmware to 2.1 and the editor to 3.4 still “DISCONNECTED” it’s a shame this not being solved yet. Dood THANK YOU SO MUCH! I went through EXACTLY the same problems as you and was about to give up until I stumbled on your post. Man thank you thank you thank.